Henry Joseph Streuli (age 14) passed away "with a smile on his face and the faith of a mountain" at 8:06PM on Friday, July 3rd, 2015 after a year long battle with Burkitt's Lymphoma. Henry was born on March 28, 2001, the son of Dr. Theresa Deisher and Scott Streuli and brother to Gunnar Streuli. Affectionately known as "Mr. Tenacity", Henry was a recent graduate of Assumption-St. Bridget Grade School. In addition to his mother, father and brother, Henry leaves behind his grandparents, Barbara and Ken Requa, Ryn and Herb Streuli, and Ann and Ron Deisher: his aunts and uncles, Monica and Paul Flora, DeDe and Chris Brandt, and Mark and Janet Streuli; his cousins, Joseph, Emily, Annie and Christopher Flora; Johnny and Christina Brandt; and Jacob and Nicholas Streuli. Henry's family invites you to celebrate his life and to pray for his eternal soul with them. There will be recitation of the Rosary at 7PM (Pacific) on Friday, July 10th, 2015 and Mass of Christian Burial on Saturday, July 11th at 1PM (Pacific) both at Blessed Sacrament Church, 5050 8th Avenue, Seattle, WA 98106. Memorial contributions may be made to Sound Choice Pharmaceutical Institute to continue the research on Lymphoma and Vaccines. Please visit www.soundchoice.org. You can follow Henry’s Facebook Memorial Page at https://www.facebook.com/weloveHenry2015. For those of us not able to attend Henry's services in Seattle, please join in the recitation of the Rosary, or a prayer of your choosing -- wherever you are -- for Henry and his family, at 7PM (Pacific) ~ 10PM (Eastern) on Friday, July 10, 2015. Click here for world time clock. Click here for How to Pray the Rosary. 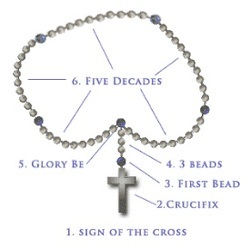 (While the Rosary is a traditional Catholic form of prayer, anyone can pray the Rosary.